Our two chickens are mostly cooped. We tried letting them free range, but alas, our Peeping Tom neighbor likes to peer over our fence and call the City whenever she sees chickens running loose. We still move the chickens around to chicken tractor beds when needed and we do try to let them free range a little bit in the late afternoons, after COB, but they are mostly cooped. The coop is small. The hen house is only 8 square feet and the coop outside the hen house is another 16 square feet. The hen house is up on blocks so that the chickens can range under it. We really would like 4 chickens so we knew we needed to find a way to provide more space for the chickens. We could not move the coop as it is currently located in the only place far enough away from the back fence and the nearby uptight, upright Peeping Tom with itchy cell phone fingers. So, we built up. After all, isn't that how its done in the city? 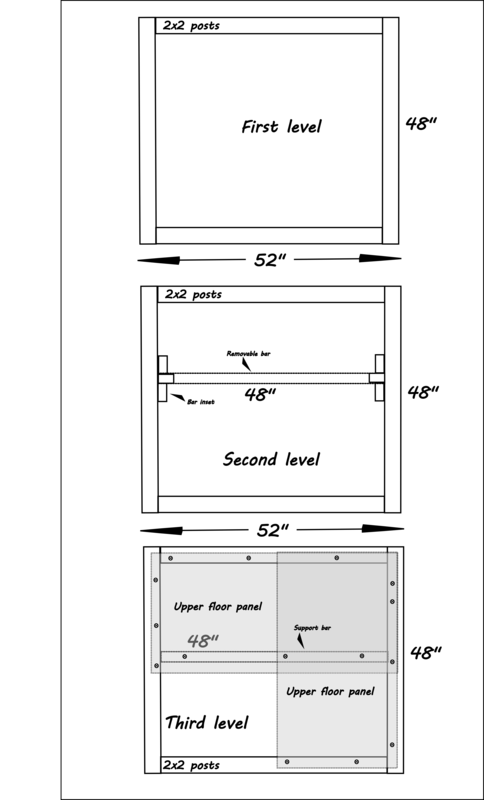 The following design is very general; the overall dimensions of our coop are 48 x 52" by 7 feet tall. The levels are placed to incorporate the locking hen house. The base of the coop is a series of 2x2 inch beams attached with metal brackets and wood screws. 7 foot tall posts are attached to the base. A series of brackets run around the outside of the posts at various heights to brace the posts and provide the support for the various levels. These brackets are built with 1x2 inch beams. The second level has a removable bar, which seats into wood brackets. A removable shelf sits upon the outer brackets attached to the upright posts. 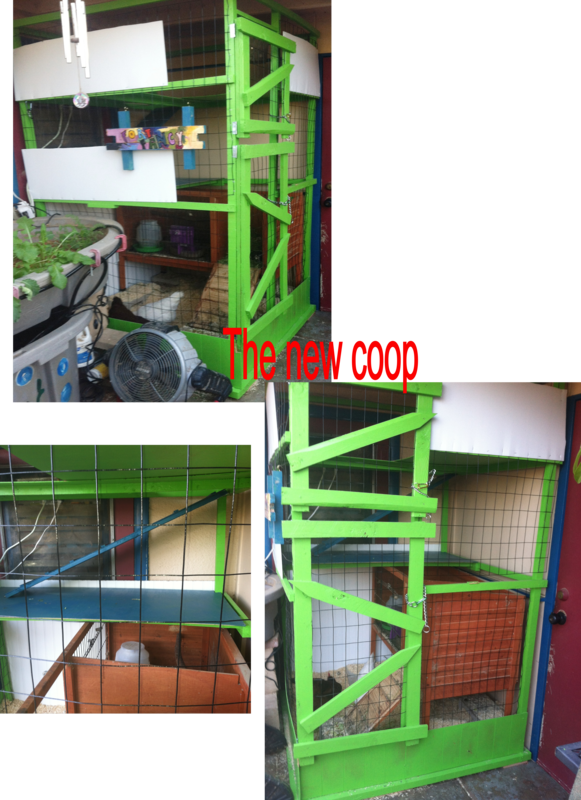 The removable post and removable shelf provide access to the hen house and make cleaning easier. The uppermost shelf also sits on brackets, but this is not a removable shelf. It is attached with wood screws. Finally, we put wood paneling at the base and Coroplast along the edges to prevent excessive scattering of wood shavings. Final dimensions of the additional square footage: 8 square feet in the hen house, 16 square feet at the base of the coop, 8 square feet in the second level, and 12 square feet in the third level. Total final square footage: 44 square feet in a 16 square foot space. But it loses something without pictures of the insides. I can't figure it out. Might be a great design if more info was provided, hence my low star rating. How do the chickens get to the different levels? What structure did you use for the coop itself? If the chix spend a lot of time on the upper levels, the floors will become a poopy mess. Maybe if they were built with low surrounding sides, they could be filled with sand or shavings... a more comfortable hangout area. I really do love this design concept, but lots more details and photos are needed, especially seeing the chickens actually use it. It is very hard to see details in these few photos. Do you have more you could add? Any chance of an update on how this is working out for you? I think you've done a great job working within your limitations. I think the next thing I'd do if I were you is plant a thick row of tall, fast-growing shrubs close together along the fence line between you and the nosey neighbor.